This easy, fun treat is filled with great chocolate flavor and gummy worms -- everyone will love them! Dirt and Worms Dessert Pops are a fun treat packed with great chocolate flavor for your whole family to enjoy! As a little girl, I spent a lot of time at my grandparents house. They lived about an hour away from me and time spent with them was always magical. We did lots of adventures together — big and small — but one of my favorite afternoon activities with my Nannie was making mud pies. Nannie and I spent a lot of days in the kitchen together: I was her official helper while she was measuring and mixing. I assisted from my perch on top of the counter. And of course, I always did a great job with taste testing. But when we weren’t in kitchen, you could find us outside in the back yard. They had a fabulous backyard with a little garden, gorgeous old trees and a pond. There was a crab apple tree in the yard with rich, dark soil underneath and a wood plank edging. We would sit on the wood planks and make our mud pies by the hour. I can remember being delightfully messy as we made our pretend creations and loving the feel of the mud in between my fingers. Of course, it’s a memory of childhood and years passed and I hadn’t made any mud pies. Then I had boys and that all changed. After having my oldest son, I was quickly reminded how much fun playing in the mud could be. I will say, my Nannie had the patience of a saint to let me get so very messy just for some fun. I have a whole new appreciation for playing in the mud now that I have kids of my own! Now I have three boys and afternoons spent playing in the mud are a favorite past time for them. That’s where the inspiration for this worms and dirt dessert came from! I think many people have had dirt and worms pudding. Some people call it mud dessert with gummy worms or dirt pudding. No matter what you call it, I think all little boys especially love to eat it! They are so drawn to worms and dirt, at least mine are. But it’s filled with chocolate, so mama loves this treat as well! 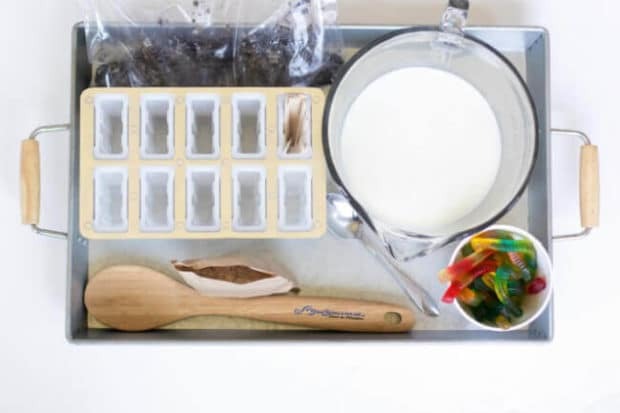 This recipe for dirt pudding with worms pops was inspired by the classic dirt and worms dessert recipe. But instead of a big bowl, everyone gets their own frozen pop to enjoy. Genius for lazy summer afternoons in the backyard! Let’s get started with how to create this fun treat. This “dirt” dessert is crazy simple and the recipe requires only a handful of items! You’ll need a large box of chocolate pudding mix, milk, chocolate cream sandwich cookies and gummy worms. Place chocolate cookies in a gallon size storage bag and seal. Use a rolling pin to crush the cookies into pieces. In a large mixing bowl, whisk together pudding mix and milk until the mix has dissolved and the pudding thickens. Stir in crushed cookies. Cut each gummy worm in half. Pour 1-2 spoonfuls of pudding into the mold. Tap mold on the counter to work out any air bubbles and to pack down the pudding. 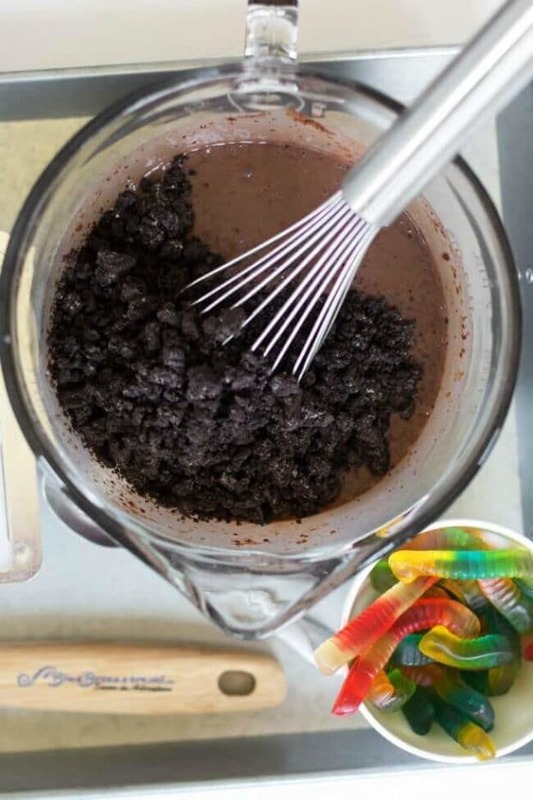 Add gummy worms and top with more pudding, tapping the mold as you go. Add popsicle sticks and freeze for at least 6 hours. To release the popsicles from the mold, briefly run them under warm water. 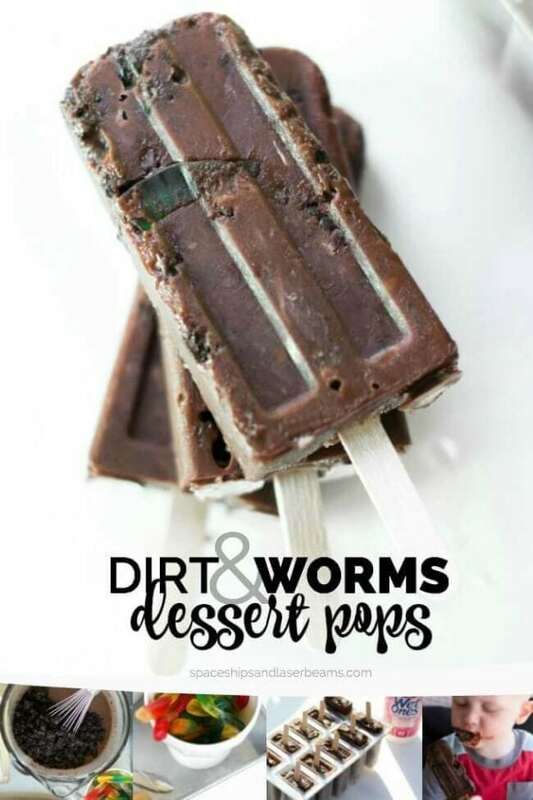 My guys love these Dirt and Worms Dessert Pops. So do I.
There’s a true rich chocolate taste, they are super-easy to make and my boys think the worms are sooo cool! Enjoy! In a large mixing bowl, whisk together pudding mix and milk until the mix has dissolved and the pudding thickens. Stir in crushed cookies. Cut each gummy worm in half. my daughter loves this dessert pops… specially chocolates… delicious! 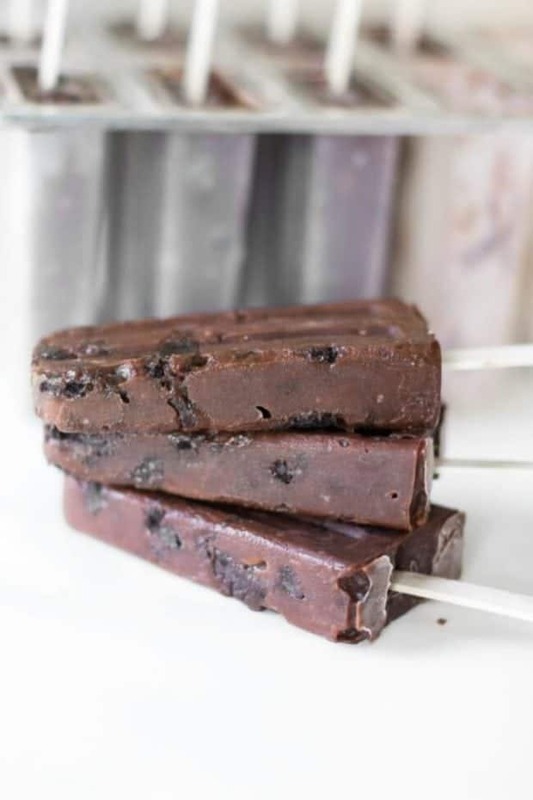 My son and I made these for a fun Summer treat… now he won’t stop asking for them!